For years Nita Strauss has lit up the stage with Alice Cooper. Now the powerful guitarist is turning up the heat with her debut solo album and a scorching new video. 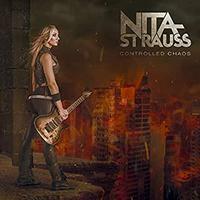 Nita Strauss has revealed the details for her Controlled Chaos record and given fans the first taste of new music from the album with the song and clip for "Our Most Desperate Hour." "From bright and fun to aggressive and dark, from peaceful to chaotic, this album is a way for me to give the listener a glimpse into my personality and what goes on inside my mind," says Strauss of the album.